Our take on a must-have premium burger on your menu. 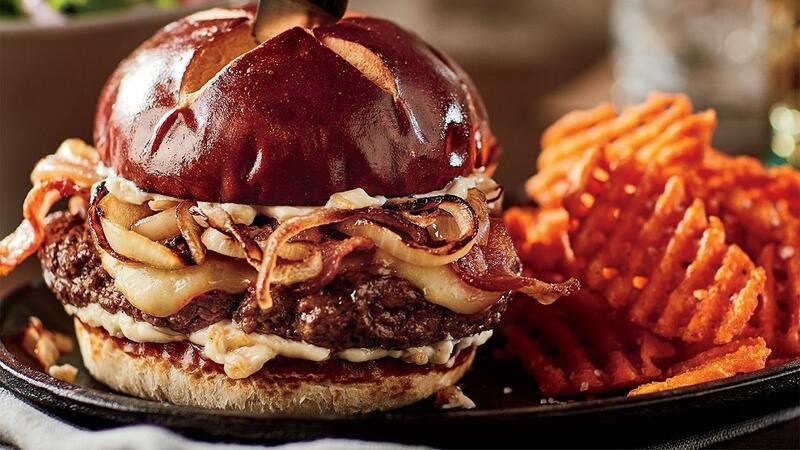 A ground sirloin patty topped with roasted garlic mayonnaise, caramelized onions, cheese and bacon – all packed in a pretzel bun. Totally awesome look, taste and flavour; view the full recipe below. CombineHellmann's Classic Mayonnaise with roasted garlic. Cook patty to desired doneness and melt cheese on top. Spread Roasted Garlic Mayonnaise on buns. Build the burger with the onions and bacon.